The Menu Express printed Postcards. Full Color • Premium Quality • Cost Effective! *All postcards on premium quality 16pt / UV coated. 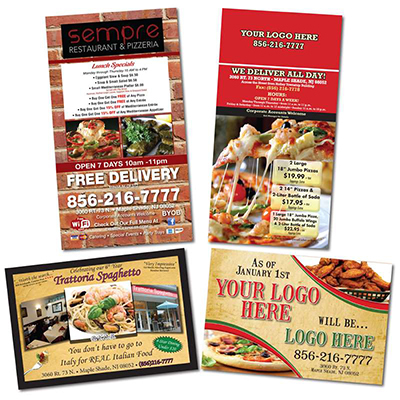 At The Menu Express, we specialize in pizzeria restaurant print and marketing materials. Make your best first impression with high impact quality Postcards from The Menu Express. Full-color postcard mailers give you the ability to make a statement with not only words but with a high impact image to get your customers attention. Statistics show that you have three seconds to make an impression. The average receiver of a postcard use it for three seconds before they make a decision on whether or not they are interested in the product you are offering. You can give them that full-color glossy impact image that will force the potential customer to read the information on what you are offering. Call us toll Free at 877-250-2819, To have your postcards printed and mailed to your target audience. To request your quote for Postcards, simply complete this form!